In 2012, the top 10 gold producing countries slightly increased their gold output. According to the United States Geological Survey (USGS) provisional data, estimated global gold production amounted to 2,659 tonnes in 2012, and was in line with 2011 totals (2,660 tonnes). With updated data for China, announced by the China Gold Association after the USGS estimates became known, world gold output rose to 2,692 tonnes in 2012, or 1.2% growth compared to 2011. The top 10 gold producing countries mined out 1,799 tonnes of the precious metal which is 2% more than in 2011 (1,763 tonnes). Among them, five countries — China, Russia, Peru, Canada, Ghana — increased their gold output and five — Australia, USA, South Africa, Indonesia, Uzbekistan — fell in production (Figure 1). Taking into account the quite borderline provisional data for Peru, Indonesia and Uzbekistan with a difference of only one tonne of produced gold in 2011/2012, these countries eventually could be either gainers or losers later, depending on final gold output figures. Figure 1. 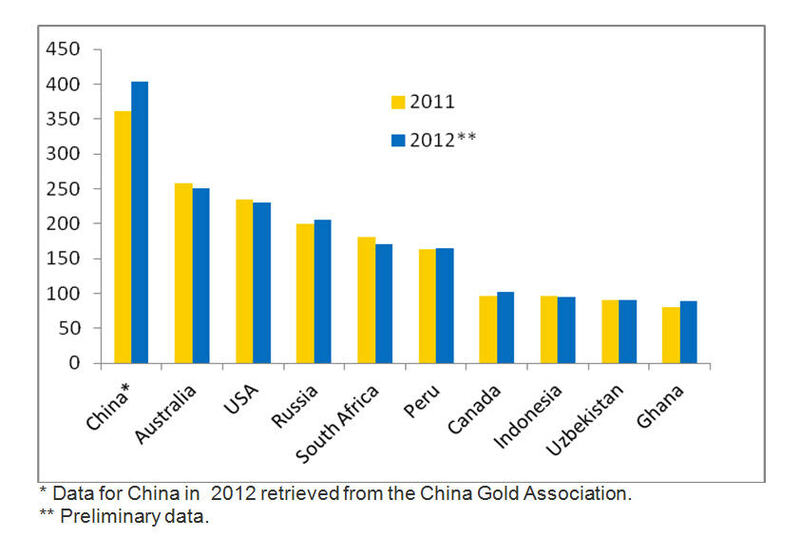 Gold production by ten leading countries in 2011/2012, tonnes (USGS data, except China). China is the undisputed leader for a sixth consecutive year with 403 tonnes of gold produced in 2012 (+11.3%) followed by Australia (250 tonnes, -3.1%) and the US (230 tonnes, -1.7%). Russia increased its gold output by 2.5%, to 205 tonnes, and holds fourth place. Ranked fifth, South Africa significantly decreased its gold production in 2012 (-6.1%). Ghana, the second gainer in 2012 gold production after China (+11.25%), closes the list of top 10 producers. Full data on world gold production in 2012 presented in the following table. Table 1. 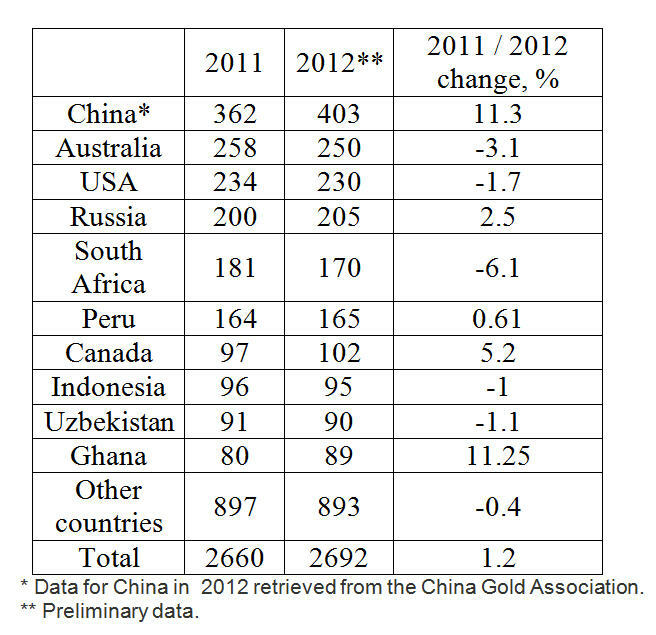 World gold production in 2011/2012, by top producing countries, tonnes of gold (USGS report, except data for China in 2012). Unlike previous years, medium and small gold-producing countries decreased their gold output in 2012, from 897 tonnes of gold in 2011 to 893 tonnes in 2012.